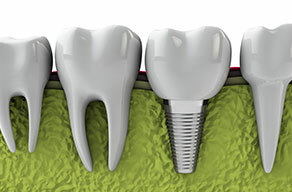 Dental implants are a great solution for missing teeth. From the visible part of your smile, to the far reaches of your mouth, implants can help you regain an attractive and strong smile. Unlike bridges or removable dentures, which rest above the gums, dental implants are located under the gums. The “tooth” placed on an implant seems life-like, because it protrudes through the gums just like your regular teeth – it’s like growing a new one! Implants work to replace any number of lost teeth. Even people with no teeth can benefit from implants, because they can swap their dentures for teeth that don’t slide when they talk or require removal at night. Because Dr. Leach handles the entire process from implant placement to crown fabrication, there’s no need to be referred to another office. Overdentures – No More Messy Denture Adhesives! People who have dentures will explain what a huge source of frustration it is to have their teeth slip, tilt, or slide while they’re eating. And using extra denture cream is no good solution. But now, Dr. Leach can offer our denture patients a better choice – overdentures. With the placement of just a few dental implants to secure the dentures, your teeth will become “locked” in place so they’re finally secure. Yet they readily snap off for cleaning. Say goodbye to messy adhesives! 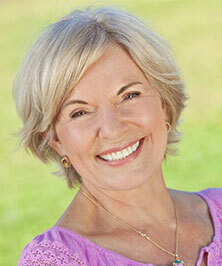 Ask us if overdentures are right for you. Don’t live with missing teeth any longer! Not all patients are candidates for implantology, so call (423) 586-3432 for a no-obligation implant consultation today!